Whether you have lots of home school supplies or a little, the fact is, that if we have systems in place for keeping things organized, everything tends to run smoother. Organizing comes naturally to some and has to be learned by others. When family members are home all day, keeping the house organized can become even more of a challenge. With some help and training, every home can have some system of organization. Some days will be more disorganized than others, but with the right set up, the house can be brought back into order with some focused effort. There is a great resource called the Organized Parent that I reviewed on my blog a few months ago. She has some great ideas for every area of our lives. Having a homeschool schedule or structure to your day can help tremendously. I don’t believe in having each subject at a certain time of the day, but in a basic block structure. 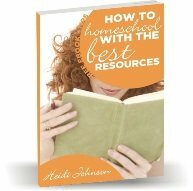 If you start out with a good homeschool planner, get my favorite homeschool resources and homeschool supplies you need, while staying within the homeschool budget that you have allotted, then your year can run much smoother too. There are ways to avoid homeschool burnout and techniques you can use when teaching multiple grades and using lots of home school supplies. Saving time in the kitchen is a passion of mine. I have spent many years experimenting and talking about the system that I use. I’ve even written some books about how to save time cooking that you can access at cooking help. Last year I wrote a book on easy meal planning called Cooking from Your Cupboard that I use almost every day. Another passion of mine is to have my family eat healthy meals. When we eat well and stay at our ideal weight, then everyone feels better. Not to mention the fact that eating well keeps us from getting sick and developing all kinds of ailments later in life. I certainly don’t have a handle on a clean house. Just ask my husband! There can be a lot of guilt surrounding keeping a clean house. When I clean the house, I feel guilty that I am not playing with my children and when I play with my children I feel guilty that my house is not clean. Somewhere in there there is a balance!! Here’s my best attempt at cleaning advice and how to create a healthy balance between keeping a clean house and having a happy family. My best organizing tips have been collected and put into an ebook called "Getting it All Done and Other Myths Women Believe". You can get tips on how to organize your day, how to set the right priorities, overcome procrastination and much more. It's only $3.99. That's a small price to pay for getting your life and house organized. 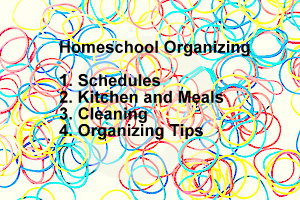 If you have any homeschool organizing tips that you have used to keep track of all the home school supplies you have, and have found a way to keep your house fairly organized, please share it with other homeschoolers. If you would like to share your tips, feel free to fill out the form below and I will read over it and post it here if I think it is beneficial. Have A Great Story About Getting and Staying Organized?